On The Famous Artists, I primarily share paintings. Many painters were accomplished in other art forms or designed pieces for other artisans to construct. Whether this entire stained glass piece is the work of the Italian artist Paolo Uccello or he only provided the initial drawing is information lost to history. Regardless of his role in creating this beautiful piece, it is definitely one of the most striking of all of the Nativity art on my site. I don’t generally change the artwork from how I’ve found it, but the picture of this stained glass panel showing the Holy Family and the birth of Jesus had a very mottled and discolored background. Granted, it may be the way the piece looks in the real world but I took the liberty of making the background a solid black color. I think it really enhanced the beauty of this Nativity art piece. Paolo Uccello was a 15th Century Italian painter. This work is housed in Duomo, Florence and was completed between 1443 and 1445. He painted primarily Biblical themes – perhaps because the Church was the primary patron of the arts. His passion was painting animals and nature. 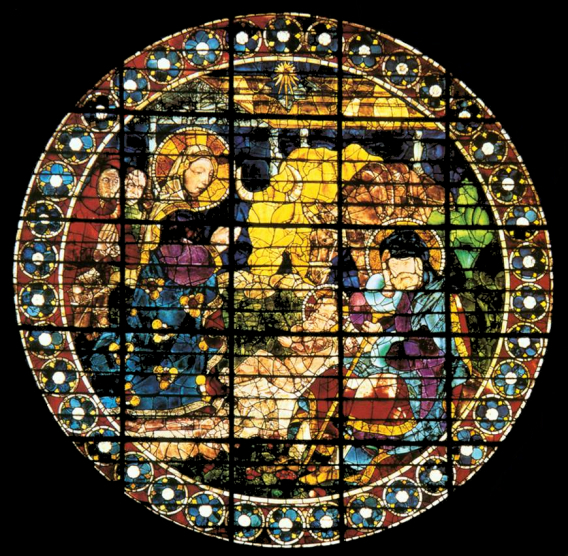 Even in this work depicting the Nativity, we see some of what he holds most dear as the animals share the center of this circular stained glass panel with the baby Jesus. Mary’s robe and the outer border of the piece are adorned with flowers. It remains obvious that this is not a nature piece and indeed a work which celebrates the birth of Jesus and the Adoration of the Magi. You can learn more about the artist and view more of his Nativity paintings and other works on our Paolo Uccello biography.